Anti-brexit marchers from Arundel and South Downs were ‘struck by the hope and exuberance’ of remainers marching for a ‘people’s vote’ in London on Saturday (March 23). Ages of those on the march ranged from nine to 77 as people of ‘varied political allegiances’ travelled by bus to the anti-brexit ‘Put it to the People’ March in London. 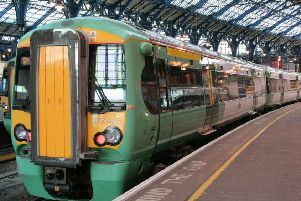 At the time of writing, 11,463 Arundel and South Downs constituents signed the petition, compared with 11,143 in Chichester and 5,512 for Bognor Regis and Littlehampton. A joint statement from prospective Liberal Democrat parliamentary candidates for Arundel and South Downs, and Mid Sussex, Alison Bennett and Robert Eggleston said the results of the petition ‘shines a light on the scale of the desire in West Sussex to stop Brexit’. They said: “We believe that Brexit is not necessary. It is damaging our international reputation and hurting ordinary Sussex families. It diminishes us all. The marchers once they arrived in London. “What struck all of us on the march was the hope, the exuberance and joy of the million plus remainers coming together in the belief that the mood is shifting. We believe that the ‘will of the people’ has changed and that to reflect that mood, Brexit must be stopped.